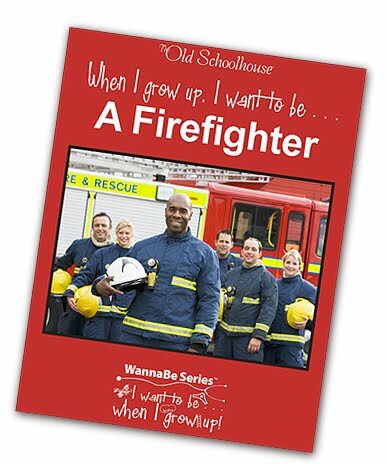 Recently, I had the opportunity to review an eBook that is made available by The Old Schoolhouse They have a new I when I Grow Up I Want To Be..... series. This eBook was great for my family and my kids’ ages extend beyond the recommended 4-10, my eldest is 11 and he enjoyed listening and learning at the same time. My kids really enjoyed learning and discussing the history of firefighters. My 8 year old also enjoyed it and I think appreciated the fact there are pictures for him as he is more or a visual type learner. The worksheets add a nice touch as I didn’t need to think of questions for them or come up with a something on my own. My 2 and 5 year old sat with us coloring the coloring sheets that came along with the download. Another nice touch is that there is a definition call out for the harder words at the bottom of the page. Some of the pages have hyperlinks on them for additional information if you want to dig a little deeper or get another picture of what they are talking about. At 30+ pages of reading it isn’t like we needed to break this up between 2 sessions and I don’t think it was long enough to put them to sleep. This download only takes a minute at most and you get everything with it, you don’t have to supplement anything as it has items like coloring sheets, a word find, handwriting, copy work, memory verse, math, American Sign Language, science activities and a Quiz. We only did a few of them, but it was nice to have all of the options. They also supply you with the answer sheets to all of the worksheets. · You can get even more out of the book through the hyperlinks throughout the text. · Even though it is a pretty inexpensive purchase, it did only take us about a day to go through it. So with that being said this is a program that I would not incorporate into our day more than once every 2 weeks or it would start to get a bit expensive. All in all I think that Old Schoolhouse did a nice job with this new series of eBooks! Here is a link to their site if you would like to get a copy for yourself http://www.theoldschoolhousestore.com/index.php?main_page=product_info&cPath=191_275&products_id=10533 . One more thing I forgot to add is that they have a bunch more careers in the I Want To Be… series, some of them include farmer, doctor, chef, pilot and many more . Other offers from this vendor are the complete series of The When I Grow Up, I Want to Be. This series is a fun, interactive way to help you guide your children to better understand the world around them and learn about the many professions that people are involved in and love. The exceptional WannaBe Series™ E-Books are NOT typical “kids” books! You’ll find no fluff here! What you will find is an excellent, complete unit study perfect for multi-ages, one that the whole family will be excited to dig into!